We have gained recognition as an eminent enterprise, devotedly engaged in offering a broad range of Planetary Cutting Machine. The offered cutter is manufactured using supreme grade components that are sourced from trusted vendors in the market who are commended for their product quality since several years. Further, this cutter is made available in different technical specifications to meet the specific demand of our clients in specified manner. Battery back-up for auto saw withdrawal. 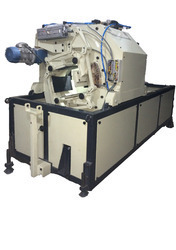 Looking for Planetary Pipe Cutting Machine ?